Some years back, San Diego’s David Feldman and his wife, Betty, took an Internet test to reveal how long they’d live. Betty’s predicted age was 102. Fortunately for readers, the forecast was fake news. His first book — “Irreverent Forever: True Tales from a Newspaperman’s Outrageously Rewarding Life” — was worth the wait. Especially for his old colleagues at The San Diego Union-Tribune and 1,100 former students at San Diego State University, where he taught part time for 32 years. The deadline never came, he told Times of San Diego. But Betty kept telling him he had to write his book. Written over three years on a PC in a spare bedroom of his home near Grossmont College, “Irreverent” is a richly painted family and career travelogue, featuring many revelations (example: his parents were married to each other three times and divorced twice, with “no one in between”). He recalls the “legalized torture” of his 1946 Marine Boot Camp at Camp Mathews (where UC San Diego now stands) and his six-newspaper career, starting with the Douglas Daily Dispatch (aka Disgrace) in his adopted home of Arizona. 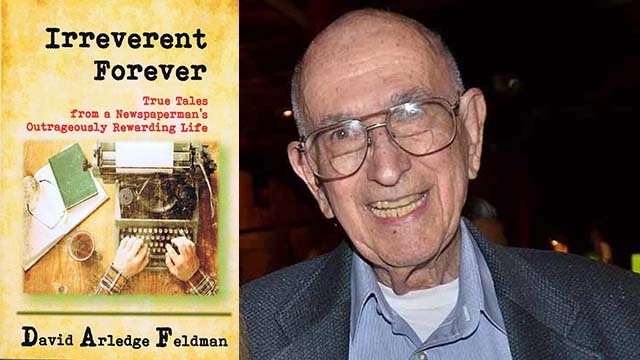 Feldman finally landed a job at The San Diego Union in July 1976 (with the help of his University of Arizona classmate Gene “Chick” Ciechanowski, who died after the book was finished last year). Feldman left the U-T in 2006, “when a fat buyout offer came along,” but continued working as a freelance book editor. Most chapters are brief and cheery, two or three pages, including one of only five paragraphs about his 10-day trial as a Stars & Stripes reporter in Turkey and Egypt. But in “Why 1957 and 1959 Were Fabulous,” Feldman shifts from first person to second, addressing his late adopted children Greg (who died at 34) and Tracy (at 54). “When people ask if I have kids, I say: ‘A daughter who loved Tucson. And a son who, I have a hunch, is watching over Vienna, his favorite city,'” Feldman wrote. He still owns the old French “Gangster Car” that Greg sold him, one of many vehicles Feldman recalls with fondness in the 226-pager published by San Diego’s Grey Castle Publishing. TIMES OF SAN DIEGO: Besides online, where will your book be sold? DAVID FELDMAN: Barnes & Noble in Grossmont mall has some copies of the book for sale. They have a table at the front of the store featuring local authors, and graciously added my book to that table. As for the publisher, Grey Castle is a boutique publisher started by Marcia Buompensiero, who lives in Little Italy. She’s written three thrillers and a ghost story. I edited all but her first book. And if Marcia hadn’t drawn up a cover and offered to format the book, it would still be five years off. She is fabulous. The book isn’t available, as yet, as an audio book. Probably not. But I’m hoping for some good reviews on Amazon. Yes. But I have written three short children’s books, featuring animals, that I hope to get published. I’ll need an artist. You write sharply but sparingly. What were your reasons for this approach? It gives readers a chance to finish a chapter and turn out the light. After 55 years as a newspaperman, it would be difficult for me to write long, involved sentences. You used real names throughout, I assume. Why not give Mert’s last name in the jerk chapter? I should have used his last name. It’s Proctor. Do my best to read Time magazine, The Wall Street Journal and the Union-Tribune. KPBS is a favorite, along with CBS news. I am a klutz with the computer, so I’m behind the curve on web outlets. I avoid Fox News, but I shouldn’t — it’s always good to know what the other side is doing. Among your 1,100 SDSU students, who might you name that people are familiar with? No great stars — just a lot of hard-working journalists that I am very proud of. Well, Nancy Cleeland might qualify as a star — she won a Pulitzer after leaving the U-T to go to the L.A. Times. Nancy was a student of mine during my two years teaching full time at the University of Arizona. What are your hopes and fears for San Diego journalism — the quality of local news coverage? I don’t cringe at the local efforts, but they could improve. I’d like to see more in-depth coverage, and more investigative pieces, although I know that is expensive. But the U-T, like most newspapers, is shorthanded. My memory says that when I took a buyout and left the U-T in 2006 we had 23 copy editors, A year later, we had nine. My hopes have gotten a little higher with news about the latest owner, a wealthy medical doctor who appears to be knowledgeable about newspapers’ problems and seems willing to help the U-T and the L.A. Times. Which local media outlets are doing the best journalism? Who are your favorite local reporters, editors or anchors? I’m not really qualified to answer this. I’ve concentrated on my own writing, and my teaching of journalism at State, which ended in 2009 when the school of journalism laid off every part-timer because of the state’s financial problems. I rely on KPBS for most TV news, with CBS in second place. Are local colleges doing all they can to prepare the next generation of journalists? Which local schools would you recommend to an aspiring journalist? Which schools are best nationally? Again, I think this goes beyond the scope of my knowledge. But I’ll hazard these thoughts: Point Loma Nazarene University, under Dean Nelson, has a solid J-program, as does San Diego State. The community colleges do quite well, too. I would recommend PLNU or State, but I’d warn the student that jobs at major media places are scarce. Nationally, the usual suspects: Missouri, Northwestern, Columbia (a graduate school), and my own favorite, the University of Arizona. If you were 18-21 today, based on current conditions, what career would you choose for yourself? I’m not cut out for medicine, nor law, nor science. Perhaps advertising. Perhaps English with an emphasis on creative writing. I might go hungry at the latter. What can save legacy news outlets as a viable business? Or should other economic models be tried? This isn’t very popular, but I think the federal government (after Trump leaves) should provide financing, with very few strings attached. It’s a tricky deal to avoid strings, but I think it’s necessary for our democracy. When did the Union-Tribune — or its rival ancestors — do its best work? The U-T was far, far to the right when I joined it in 1976. It was the “flagship of the Copley fleet” but not a great newspaper. It moved somewhat closer to the center over the years. And it won a Pulitzer by taking down a Republican congressman for bribery and seeing him off to prison. So perhaps it did its best work from 2000 to 2010. Is copy editing a dinosaur profession? Learning and practicing the English language, and perhaps saving it from falling on its face, is never bad. Nor is it a dinosaur. The media are teachers. After WWII, a newspaper was started in New York, and it decided to have NO copy editors. In about a month, it learned its lesson and hired a bunch of copy editors. Copy editors repair the reporters’ stories and write the headlines. Is our culture or society doing enough to exploit the talents of our oldest citizens? No. There’s a lot to learn from us older folks. Getting the younger folks to listen is the problem. How politically active are you? What’s your advice to young people pained by current events? I joined a phone bank for Democrats several years ago. Betty and I always vote. Two years ago, my wife and I knocked on 20 doors in our neighborhood for a candidate. And we’ll put candidates’ signs on our front lawn. As to the young people, they need to march, and to join the volunteers of the party of their choice. Can the nation’s divide over the Trump presidency be healed? How? The phrase “This too shall pass” comes to mind. Combating his lies with the truth should help. And it will take time. Are you worried about Fake News (propaganda and nonfactual reports) in social media and certain websites permanently injuring U.S. democracy? What can remedy this? I am very worried about Fake News. But I don’t see it doing permanent harm. The U.S. is resilient. The remedy, as always, is the truth, and emphasizing the truth. What books are you editing now? How long will you continue this work? I’m about to start editing a book by a medical doctor. His is a heroic story, plus he’s a very good writer. I think I’ll taper off on the editing — perhaps do it for two or three more years — as I concentrate more on my own writing. You’ve lived, and traveled, all over the world. Why have you and Betty chosen San Diego? What do you and Betty do for fun, recreation? What occupies her time? We go to movies, concerts, plays and good stuff like that. The arts, you know. Betty meets with former workers on a monthly basis, and tenderly raises our 35 plumeria plants. How do you hope to be remembered — well after you hit the big 1-2-0? As a good editor, a good writer, a good teacher, and mostly as a decent sort of chap, you know.